You can check in and tweet that you're there, but get out from behind the digital and do a little IRL social networking. Karwoski & Courage integrates proprietary research, account planning and award-winning creative to generate smart work that creates meaningful results, adding value to clients’ marketing efforts. Founded in 1992, Karwoski & Courage is uniquely suited to provide a broad range of public relations and marketing communications services. As an independent operating company of Martin|Williams, Inc. (Omnicom), Karwoski & Courage can access the resources of a $300+ million marketing communications organization while providing a high level of service to clients as a midsize public relations firm. 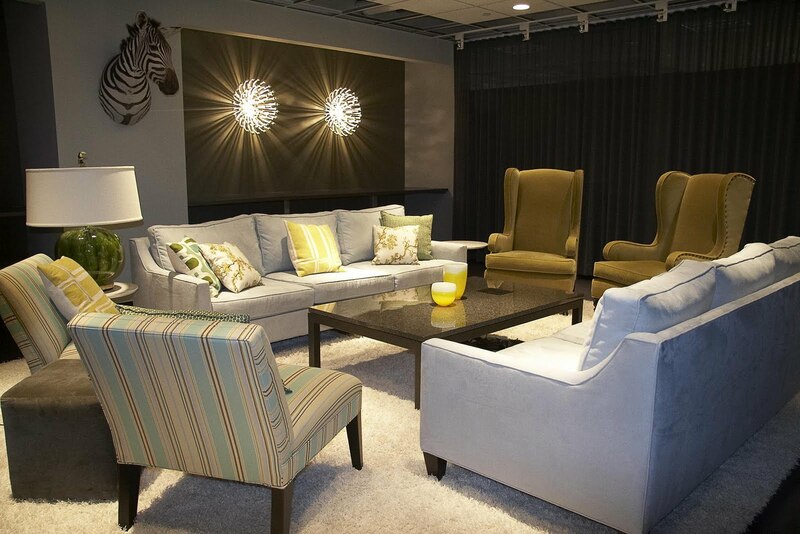 In their shared office space, Karwoski & Courage and Martin|Williams staff members are encouraged to collaborate across account teams and agency-wide disciplines. The agency considers this an important part of its culture, as well as an important differentiating factor from other agencies. Karwoski & Courage has built considerable expertise in the oral health care arena with clients like 3M, Patterson Dental, GlaxoSmithKline, BiteTech, and A-dec. But oral health care is by no means the agency’s sole focus. Karwoski & Courage also has extensive healthcare experience with clients in vision care and drug delivery systems, and additional expertise with clients in agriculture, architecture and design, graphics, industrial design, food and hospitality, manufacturing, and industrial services. The agency’s work encompasses research and account planning, media relations for consumer and business-to-business audiences, advertising and related marketing communications, event and cause marketing, social media strategy and execution, community relations, crisis and issues management and corporate/internal communications. With in-house research capabilities including MRI, Yankelovich, PRIZM and Claritas, Karwoski & Courage has the tools to guide strategic development of every aspect of its work. Nationally recognized for its innovation, brand-building, and analytics Karwoski & Courage possesses a rare combination of strategic expertise, award-winning creative and flawless execution that delivers measurable and meaningful results. Karwoski & Courage Public Relations recently added three new clients to its roster—A-dec Dental Equipment, Kinze Manufacturing and the law firm of Felhaber Larson Fenlon & Vogt. The new business deepens the agency’s existing ties to the health care and agricultural industries, as well as its expertise with local professional services firms. with GlaxoSmithKline consumer dental products, including Sensodyne and Aquafresh toothpastes. advertising teams will create a new integrated branding and selling effort encompassing brand and engagement strategies, social media, event marketing, advertising and public relations for the company, which employs 600 people and operates a 23-acre manufacturing facility at its headquarters in Williamsburg, Ia. practitioners in the field, and represents more than 60 jointly administered employee benefit trust funds. Karwoski & Courage has also added two new Assistant Account Managers to its team, Vanessa DeBruijn and MaryEllen Columbus. DeBruijn, a 2008 graduate of the University of Wisconsin, brings previous experience from Lindsey, Stone & Briggs, a full-service advertising and public relations agency in Madison. DeBruijn was a two-time recipient of the Irwin Simms Scholarship at the University of Wisconsin, and also served as an intern at Madison Magazine and On Wisconsin Magazine. CentraCare Health System and Grand Itasca Clinic and Hospital. The Minneapolis office of Weber Shandwick today announced the promotion of Denny Shields to senior vice president in its Public Affairs practice. Shields joined Weber Shandwick in 2006, bringing his extensive relationship building skills and public affairs acumen to his work with the firm’s defense industry and government clients. He led the team that created a grassroots community outreach program for the U.S. Army, helping to change how the organization engages and reaches community influencers and potential recruits. The program has been recognized as a finalist for PRWeek’s "Community Relations Campaign of the Year" award, and won an International Public Relations Association Golden World award. Shields has also been critical to new business development within the defense industry and Minnesota state government, as well as leading account teams and clients to successful outcomes. “Denny is a thoughtful, considerate and dedicated leader who is genuinely interested in developing talent at all levels,” said Eric Pehle, executive vice president of Weber Shandwick’s Public Affairs practice. Prior to joining Weber Shandwick, Shields, a retired Army colonel, served as a military and government spokesman for more than 15 years. He provided communications counsel to senior elected and appointed government officials and, while serving with the Minnesota National Guard, built a community relations program that was used as a national model and was recognized with a regional Emmy award from the Upper Midwest Chapter of the National Television Academy. 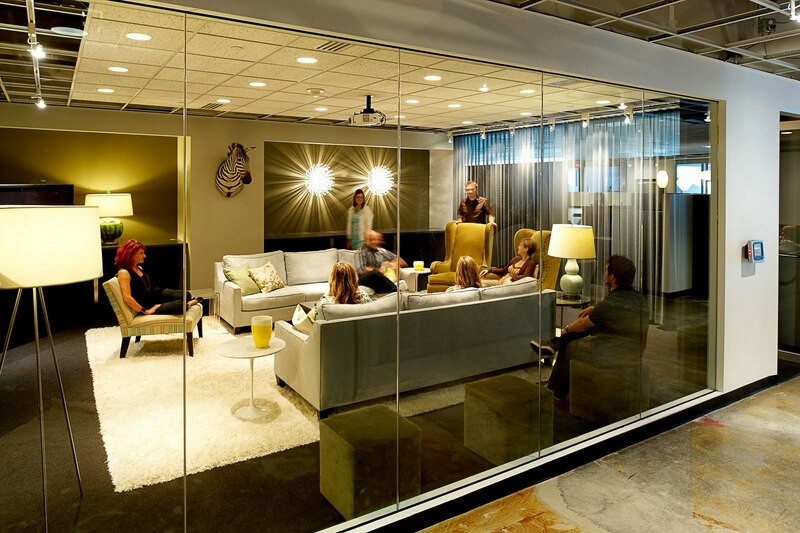 Shields’ community leadership has also been a great asset to Weber Shandwick’s Minneapolis office. He is member of the Twin Cities Communications Council and serves on the board of directors of STARBASE-Minnesota, a nonprofit corporation that delivers math and science education to public schools in Minneapolis-St. Paul. He is also a board member of the Minnesota Military Family Foundation, serves on the Marketing and Communications Committee of the University of Minnesota Alumni Association and is a member of the Twin Cities Dunkers breakfast club. Shields holds a bachelor’s degree in political science and economics from the University of Minnesota and completed graduate work in business administration at the University of St. Thomas. Be inspired to approach B2B communications with a better perspective on what works and what doesn’t. Gain valuable insight on how to get and maintain interest from busy high-level executives. Walk away equipped with C-level messaging and offer ideas that can instantly have a greater impact on the effectiveness of your communications programs. Penn will discuss the seven ways B2B is completely different from consumer direct marketing and why that knowledge is so important in crafting communications. “When you try to engage executives in the C-Suite, it is absolutely critical that you understand where they live in the organization, how they think, what they look for and what absolutely turns them off immediately,” says Penn. “Do it right and doors can open. Stumble and you may as well not bother." The event will be held at the Metropolitan Ballroom in Golden Valley, Minn. Registration and breakfast will begin at 7:30 a.m., followed by the program from 8 to 9 a.m. The cost is $30 for BMA members and $45 for non-members. Attendees can register online at www.bmaminnesota.org through Sept. 17. A limited number of walk-up registrations are available. Abbey’s Hope Charitable Foundation has chosen Gabriel deGrood Bendt (GdB) to help educate Minnesotans on the dangers of improperly maintained pools and spas. The Foundation is named after Abbey Taylor, the Edina, Minn., 6-year-old who died in 2008 as a result of injuries sustainedwhen she became entrapped by a pool drain. “This is an issue that flies under the radar for most parents,” said Doug deGrood, creative director. Since 1999, 14 children have died as a result of improperly maintained pools, according to the Consumer Product Safety Commission. Many more have been significantly hurt. “GdB has a long history of cause-related advocacy,” said Tom Gabriel, agency CEO. Over the years, GdB has helped support more than 37 local organizations focused on community-driven initiatives such as cancer, children’s disabilities, hunger, homelessness and performing arts. Its current community roster includes Science Museum of Minnesota, MacPhailCenter for Music, and Gillette Children’s Specialty Healthcare. “I’m glad the agency can help on such an important cause,” Gabriel said. Recent analysis from PR Newswire confirms what they have suspected for a while - press releases that include multimedia elements generate 77-percent more views than releases that contain only text. PR Newswire offers reasons why their multimedia releases receive more views, but regardless of the platform, news releases that contains photo and video assets reach more people by the vary nature of the assets it contains. Every asset is a piece of sharable content in and of itself. Not only are these working double-time from a search perspective, but each asset also has a second “home” on the social web where it can be shared or favorited on other networks – increasing the shelf life of your message and the likelihood that they will be viewed. Additionally, the multimedia release itself contains social sharing features, and readers are more likely to actively share multimedia content than text-only content. You may have ditched the .pdf attachments a while ago, but are you using multimedia to ensure all of your news releases are working to their fullest potential? A multimedia release does not have to be expensive or labor intensive to produce. A few years ago, our firm recognized that if we could package all of the material that an editor, reporter or blogger could possibly need in one place, we'd be making their job easier, and in turn, make it more likely that they'd act upon the information. At that time, we put our proverbial eggs in a little basket called Pitch Engine and we haven’t looked back. We’ve been recommending and building their social media releases and newsrooms for our clients ever since. If your release doesn’t require wire distribution, solutions like Pitch Engine offer the features of a multimedia release at a fraction of the price (and then you can do your own, customized distribution to the key contacts on your media list). But...multimedia assets cost a lot of money to produce, right? Not true. It’s not necessary to budget for high-end production of multimedia assets for your social media release or newsroom. In fact, many anecdotal reports indicate that video footage taken from an inexpensive digital camera is more likely to be viewed and acted upon than professionally produced videos. Remember – the more assets you have to support the content of your news release, the more likely it is to be viewed and shared. The news release is no longer two-dimensional. It’s a robust container of content that, when presented to your audience, will be opened, disbursed and repurposed. *That’s right…the nature of the social web is that things are shared. If your industry association or someone else has produced a great video that helps to tell your story, consider using it, but remember to give credit where credit is due. Today, it’s easier than ever for companies to talk directly with the public. And, the public is expecting it. This is contrary to everything brands and media relations professionals have been practicing for decades, but really, it’s time to adjust or be left in your competitor’s dust. Long story short, a few weeks later, a huge Target truck was parked outside of my home office (that in itself was enough to melt this Minnesotan’s heart) and this Steelcase Walkstation was wheeled in and set up. And, you can guess what happened next. I was twitpic-ing and G+ing and Facebooking the heck out of the fact that I had the demo, and was suddenly walking 6-10 miles per day while working. 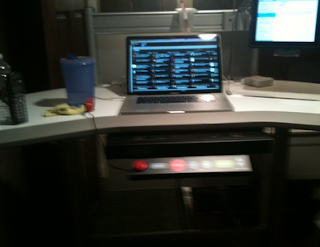 I don’t blog about fitness, treadmills, workplace environments or the like. I’m quite certain Kris didn’t check my Klout score before offering this demo. I don’t have 20,000 followers on any particular social network. But, I do work in marketing and PR, am tightly connected to a community of other professionals who I talk with a lot, and in turn, share a lot in their networks. Kris saw an opportunity there. 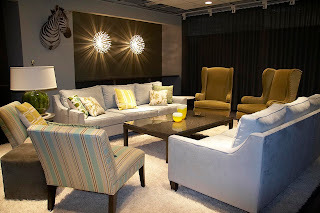 And, due to the relationship Kris and Target Commercial Interiors has built with me, I have wonderfully confident feeling about them and their product. Of course, several of my followers became quite curious about this setup. ...take time for back and forth about what I thought of the product. ...tell them how wonderful their delivery guys were (especially on the hottest day of the year). ...share how awesome the company is to work with. ...send them a link for more information. Good (or bad) Public Relations can, and does, occur within any department. Now more than ever, it’s key to pay attention across silos and understand how others in the company are forging relationships with the public. I have never purchased anything from this company, yet through this small effort, I’m pretty much a fan for life. With this effort, Kris put feeling (my feeling) ahead of sales and sat back to see what would happen, if anything. The company put faith in the long tail return and confidence in their brand persona, and let it shine. And, for this member of their public, and those members I reach with my stories about them, that's more powerful than any press release. Today, it’s not possible to get an “out of office” from a tweet, Facebook post, or blog comment. At best, you’ll look as though you’re ignoring your community. At worse, your (or your client’s) reputation could be on the line while you’re sipping margaritas on the beach. Have a plan for monitoring. You can head out of the office, but that won't stop people from talking about you or your clients online while you are away. You can not afford to take vacation from monitoring these conversations. Crises hit when we least expect them, and you don't want to be caught unaware. In his guest post on the Radian6 blog, Aaron Friedman offers advice for prioritizing mentions and assigning someone to respond in a timely manner. Again, you’re going to need to rely on your team (unless you plan to be tethered to your smartphone), but some realistic planning can go a long way to ensure that things are being covered while you’re away. 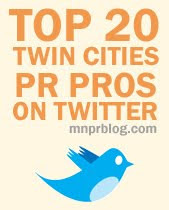 MNPR Community Challenge: Add to this list. What has worked for you and your team? How to you manage the “out of office” for online engagement? In April I decided to go on an eight-day trip to Central America with a group from my church. At first I was hesitant because I thought I may be starting a new job. But my wife really encouraged me to consider going. Because as she said "if not now, when?" So here I am, 14-months into unemployment, and I have decided to travel to Belize for an 8-day adventure. I am going with a team of 10 guys and we'll be working to build relationships with the local men and encourage them in their roles as fathers, husbands and leaders in their community. The Minneapolis office of Weber Shandwick today announced the promotion of Jessica Mike to account supervisor in its Farm and Food Advocacy group. She joined Weber Shandwick in 2008 and has since delivered exceptional results for her clients as an organized, focused project manager. Mike develops and executes trade show plans for events with tens of thousands of attendees, and writes and directs communication materials. In addition, her skills at preparing crisis management drills have made her an invaluable asset to clients and colleagues alike. Prior to joining the agency, Mike worked at a local public relations firm on media relations and strategic planning initiatives. She holds a bachelor’s degree in journalism with an emphasis in public relations and a minor in business administration from the University of St. Thomas. Campbell Mithun has tapped 11-year veteran Lynn Franz to lead planning for the agency, naming her senior vice president, director of strategic planning. Franz joined Campbell Mithun in 2001 and established herself as a driver both of processes and technologies that pinpoint consumer insights to drive brand strategy. To fuel the agency’s Everything Talks communications philosophy, Franz grounds the strategic-planning process in deep listening to both consumers and brands. She pioneered the agency’s use of tools such as Semiotics to identify inherent yet subtle brand truths, uses online message testing and social-listening tools to tap real-time consumer sentiment, and also leverages resources such as Iconoculture and Brand Index to quantify insights. Franz earned the national Jay Chiat Planning Award for her work on H&R Block in 2008. Prior to joining Campbell Mithun, she served as director of market research at Warner Bros.; she holds English Literature and graduate MBA degrees. Franz fills the vacancy left by former planning director Lance Saunders, who departed in October 2010 to become managing director of DDB Canada’s office in Vancouver. 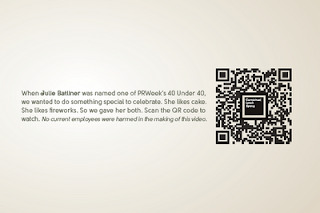 Julie Batliner, managing director of Carmichael Lynch Spong, was recently named one of PRWeek’s “40 Under 40” for 2011. The report features 40 professionals under the age of 40 who demonstrate “innovative thinking, strong determination, and results that indicate a long and successful career in the PR industry” across agencies, corporations and nonprofits. Batliner will be featured in a special report put out by the publication August 1, 2011. This acknowledgement is one of the highest honors a young, but successful PR practitioner can receive. PRWeek grants these awards annually to 40 professionals that have demonstrated outstanding leadership, contributed to the advancement of public relations as a profession and “have achieved tremendous feats before they turn 40.” PRWeek created the special reports in 2007 to celebrate those that help draw in new clients, provide excellent results for current clients and set a great example for those who wish to follow their path.